COLOUR ME RED: THE SOCIAL STUDIO. ** This dress is made from only recycled and excess manufacturing materials gathered from the local industry. WORDS BY SIGRID (SIGGI) MCCARTHY. For my final research project in third year, I researched the local fashion industry and the ways in which many local outworkers were being exploited. Not only did this project open my eyes to the ills of the fashion industry - an industry that I am very interested in and have respected for a long time - but it also highlighted to me that I could potentially mix my love of fashion with my strong interest in human rights and the environment. In order to really make a difference in this industry, I believe that one must acknowledge the potential for ethics and aesthetics to coexist and that more so, one must actually love fashion. You cannot write the industry off all together and treat it as a frivolous joke when attempting to create change. Like it or not, the fashion industry plays a huge role in society, and the general public is not going to wake up one day and convert to a nudist's way of living. Instead of merely coming from a critical standpoint, we need to create new ways of ensuring that consumers have ethical and stylish alternatives to fast, unsustainable fashion. Undoubtedly, there is still a stigma attached to the term sustainable fashion - something along the lines of undyed homespuns and unattractive design - but I believe there is potential for designers to completely eradicate this stigma. Whilst I do think we have a long way to go in terms of offering consumers greater choice when attempting to shop ethically, I would like to emphasise that there are many labels, both international and local, already striving to create garments with both integrity and an understanding of good design and execution. "The Social Studio label is designed and made at our Studio to an extremely high quality using hand dying and finishing techniques. All garments are ethically made using only reclaimed and up-cycled materials gathered from local industry. This is certified by Ethical Clothing Australia. Each collection is a collaboration; between all the new and emerging designers at the Studio bringing together an array of talents, styles and cultural influences to create vibrant and contemporary collections bi-annually." I would highly recommend popping into the Studio, which is located at 128 Smith Street in Collingwood. They make everything on site in an exposed workshop, and the staff are very friendly/knowledgable. It's refreshing to find a transparent business that encourages their customers to understand the origin of their purchases. 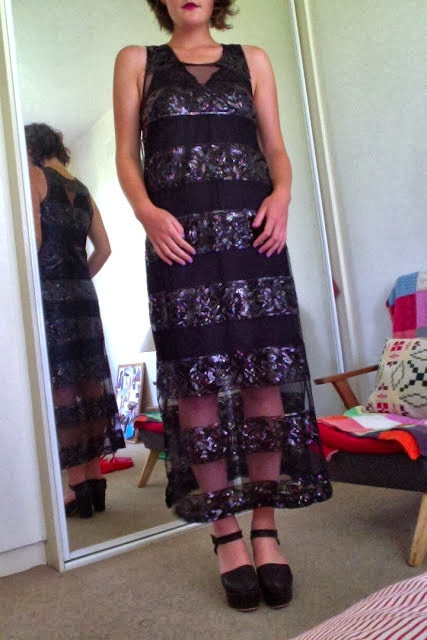 NOTE: This photo is of a sequinned dress I bought today from The Social Studio. I need to buy a proper slip to go underneath it, as this one is just a lace nightie of mine and doesn't quite work with the dress, but you get the idea. My apologies for the terrible quality of the photo - you're looking at a guerrilla type photo shoot in my room with the MacBook program 'Photo Booth.' I will upload some better ones soon to do the dress justice! ULYANA SERGEENKO SPRING COUTURE 2013. RUBY JEAN WILSON IN VOGUE AUSTRALIA.